This is the last of the What We Live With series. Above is the living room wall of open shelves by the stairwell. Very little changes here. But some close ups of some of the things. 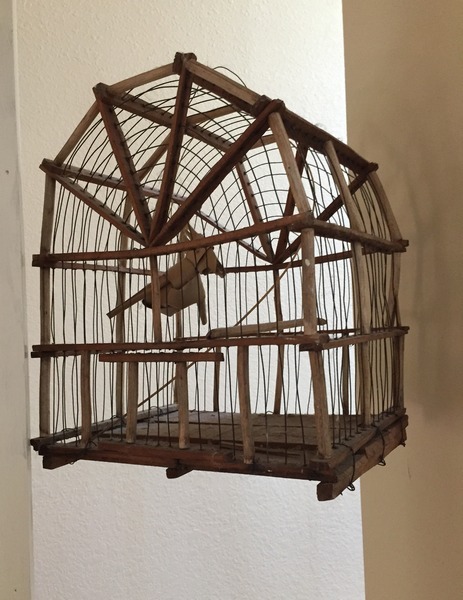 Bird cage with a palm woven bird from Bali. The cage came from Common Ground in Asheville. Always a good place to find things that need to come home. Below the cage is only a part of the oil can collection. 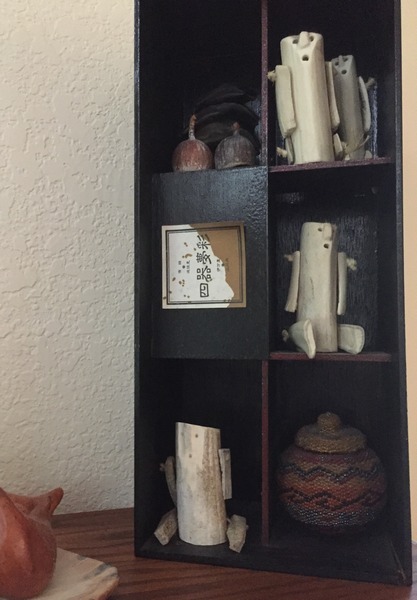 Bamboo pieces from Japan and an Indonesian healing gourd figure. 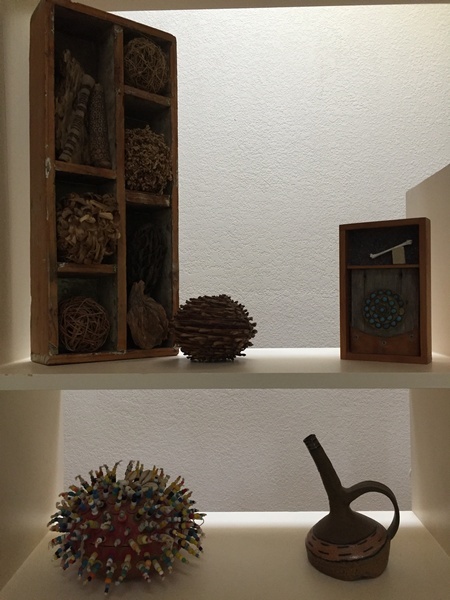 Baskets from a friend in Australia, an assemblage from a man who ran a restaurant in an old stone church in Tasmania, a voodoo basket from Africa, and a clay bottle a student made at Arrowmont. 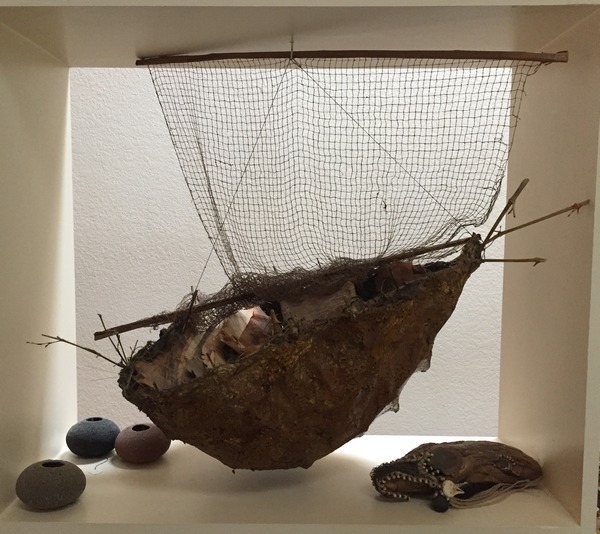 A boat I made about memory recollections, three lovely baskets by an Australian artist and a piece of wood with metal weaving and beads made by me in the early nineties in a class on metal patinas. You can pick it up and shake it because copper things are behind the woven mesh that closes over a hollow in the wood. It feels good in the hand. 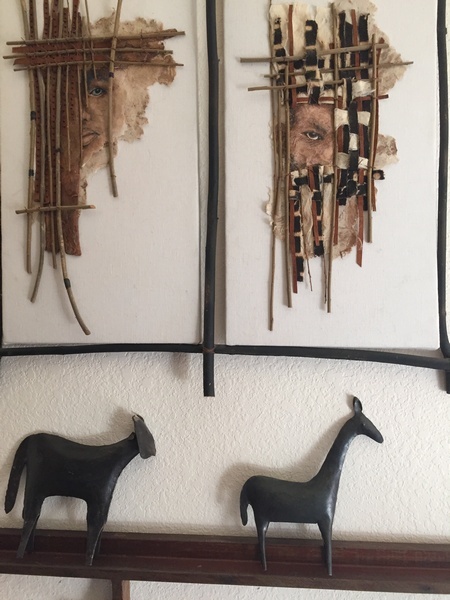 Coming into the open room of kitchen, dining and living room hangs these two small pieces. A lovely photograph Phil Diehn took of some of my oil cans and a fun piece of folk art from the show in Atlanta. 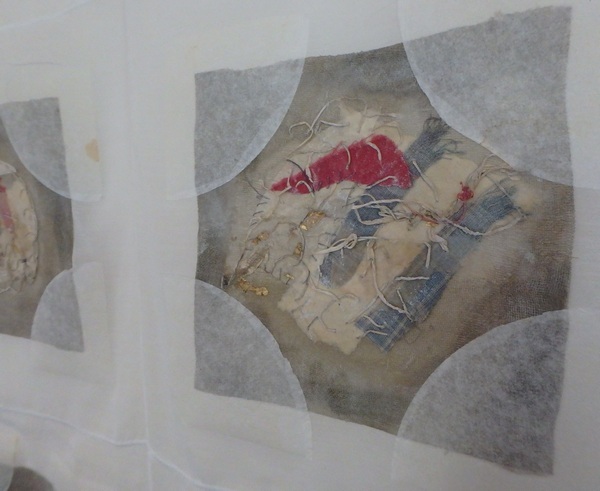 It is simply masking tape over sticks…then painted. An irresistible cow on my side of the fence. 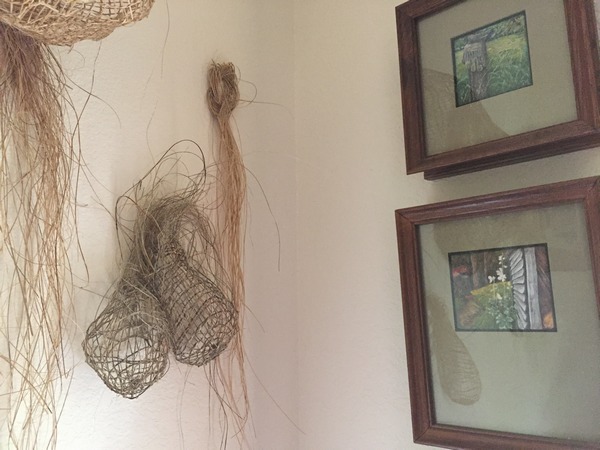 In the den are egg tempera paintings I made about the loss of farming/farmers in western North Carolina and just part of a wall filled with New Zealand flax baskets that I make every time I go to Australia. 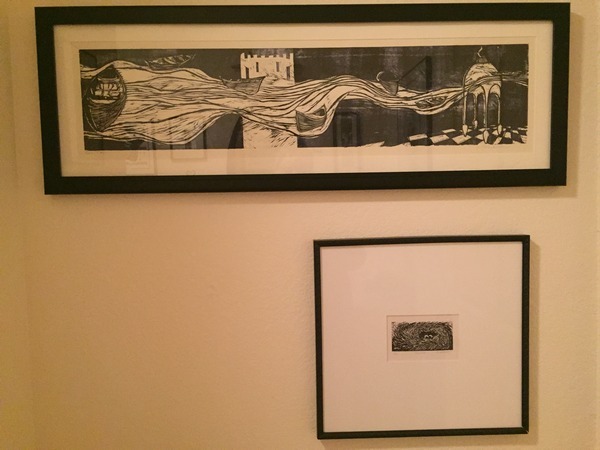 Behind the door in the guest bathroom hangs a very large woodblock print by Gwen Diehn and a small nest of mine. It was my first wood engraving. 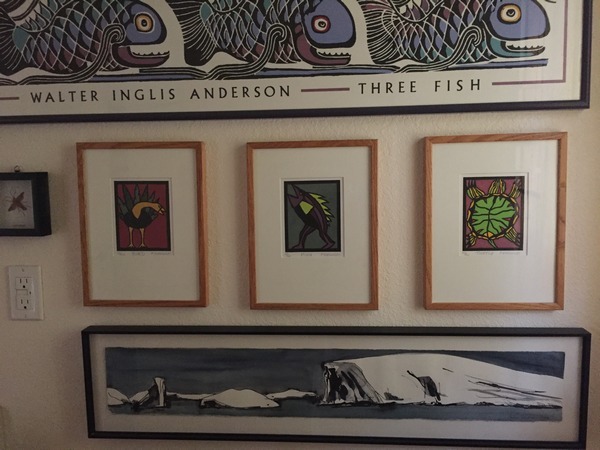 Also in that same bathroom hang among other things, a large print by Walter Anderson bought on a trip to New Orleans, a long scrolled journal painting that Helen Sanderson of Australia gave me from her trip to Antarctica. And three hand printed illustrations that were from a children’s book on Jamaica made by Philip Kuznicki, who rented a house from us at one time. There are many more prints in this small room but these I could photograph without getting too much reflection. In our bathroom hang the Inner Navigations Series minus one that sold. They are around my corner tub with a Nantucket basket I made in the eighties. 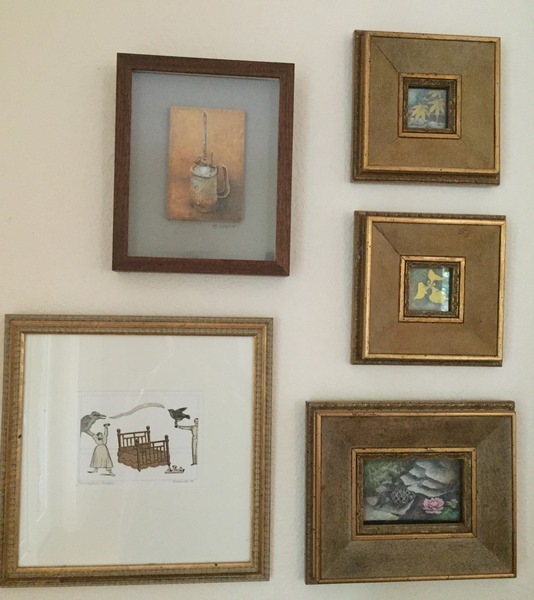 Over my dresser hangs several smaller pieces. More egg temperas I did of my water garden and an oil can. 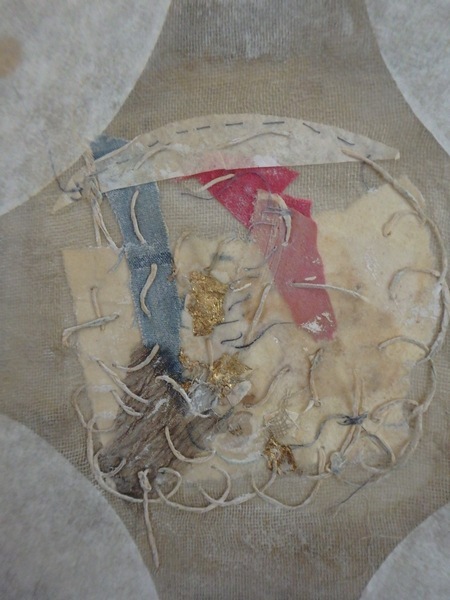 Plus a collage piece by Philip Kuznicki. Another egg tempera painting on board that I did depicting a story told through three generations of men. 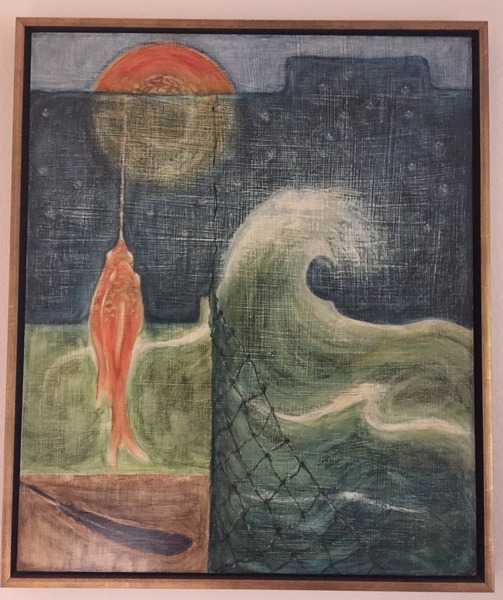 The beginning of a series I painted of man’s encroachment on the earth hangs with those egg temperas to one side. 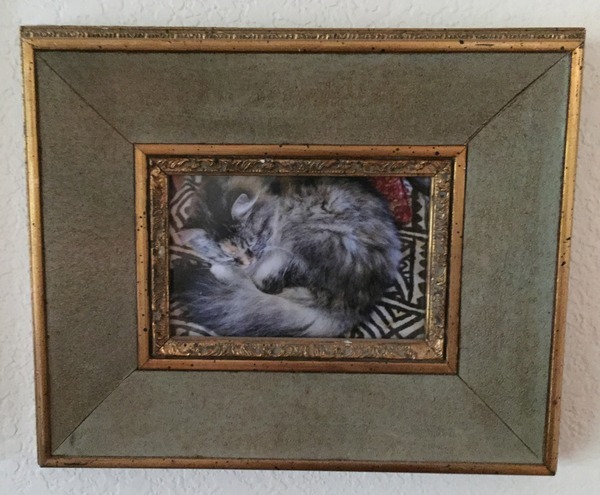 Pictures of our cat, Spooky, no longer with us on another side. Photographed by Phil Diehn. And long gone Sara on a small wall. So that is the finish of the things we live with. No need to open kitchen drawers or cupboards. No need to photograph books on shelves. These are things that have stories. These are the things that remind me I went some place, I did something, and it mattered. As for the dementia shawl, I am filling it with stitches. Art Group meets here in a couple of days. Hopefully I will be getting back to printmaking. Some other things that just stay in place. On the long thick pine bench my husband made and runs along a wall that faces the front door has at one end a stoneware vase. I put the reddish sticks from some out of control willow bush with white and green leaves in it. The bush was supposed to look like the neighbors down at the end of the road, but no, it throws floppy branches out into the driveway to rub across my car. It sort of flails it arms in a sense, and a couple times a year I have to cut it back. I think this only encourages it. But the branches are a deep wine red and I bring them in to poke into this vase. Then I add Eucalyptus stems that refuse to fall apart. The fake red berries are so totally not me, but once in the vase over the holiday season, they stayed. Only two rocks were supposed to be here. They were handy to take to classes when I taught earth pigment gathering and processing. 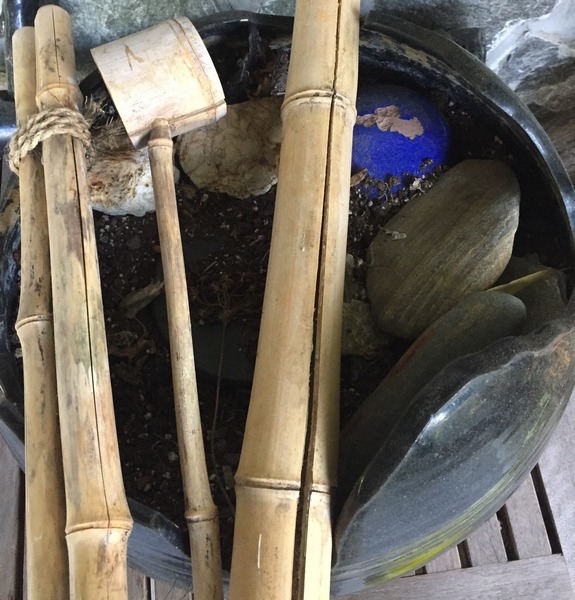 For some mysterious reason, my husband has decided to bring rocks in to join them. I said I thought there were enough there now….but he may not remember me saying that. 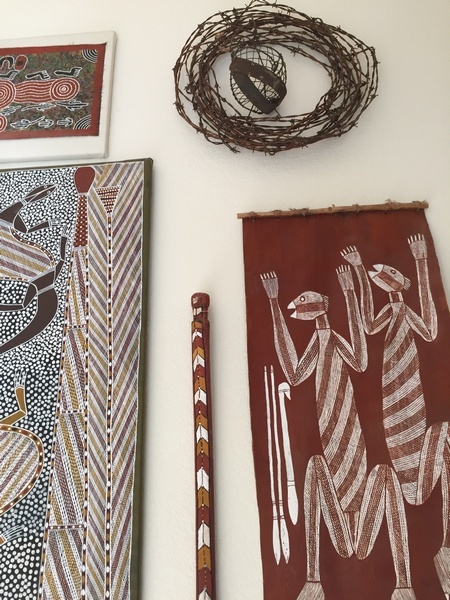 Above the bench hangs a collection of Aboriginal Australian art. They are pieces that could not be left behind once found in galleries or meeting the artist. And above them is a coil of barbed wire from along our road. It was my Christmas wreath for two holiday seasons. In the barbaric calf muzzle that I attached to the wire wreath I hung holly, bright green and red from a tree not far from where the wire was harvested. I wanted something different for a wreath on the front door. It was too different for a neighbor who came by. He was reading too much into it….way too much. These are faces of apartheid from a photojournalist’s book. He was documenting South Africa while Mandela was still imprisoned. Again, I could not put the book down once I saw it in the store. I drew the faces with paint on tapa cloth and used sticks and fabrics to capture what it was that I read about them. The eyes staring out from the page just was not enough….I wanted to see them more often. The iron animals below are part of a large collection that started with just a couple. Originally they were made from oil drums in the Caribbean, then likely, when popular, mass produced in India. I love the way the cow’s head is flat and at right angles to his neck. Each one has such character. At right angles to them is the bowl of rocks watched over by a black bird. 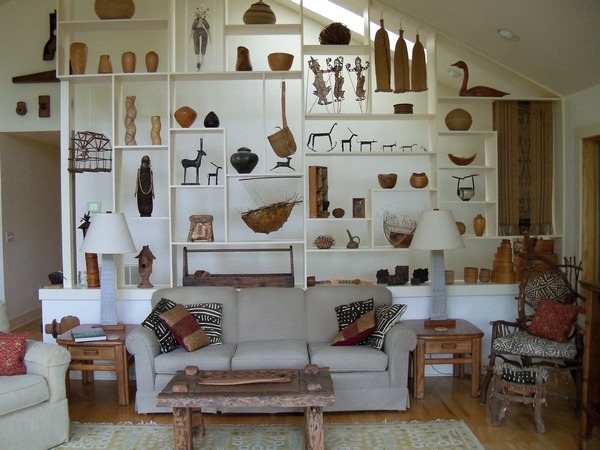 Hanging on the wall above are Aboriginal baskets from Indonesia and Australia. There is very little in our house that is not in this same palette of browns and golds and beiges and greys. On a chest from Bali sits some clever sculpture pieces with rocks, basket, nest…all back dropped with an old Indian textile tied carefully onto a black framed fabric so as to show the edges and disperse the weight evenly. And when I go out onto the porch through the door just to the right of the chest, I see this. 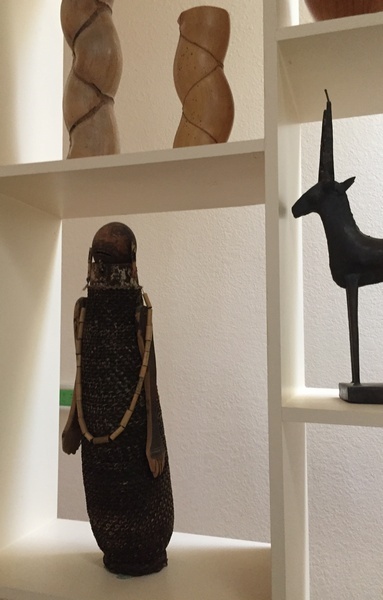 Baskets, a face jug and a tall sculpture that I made of spare parts from local farmers and a large rusted piece of metal that looks a bit like a horse’s head…well sort of. It was bulldozed up by the man who excavated for our house. 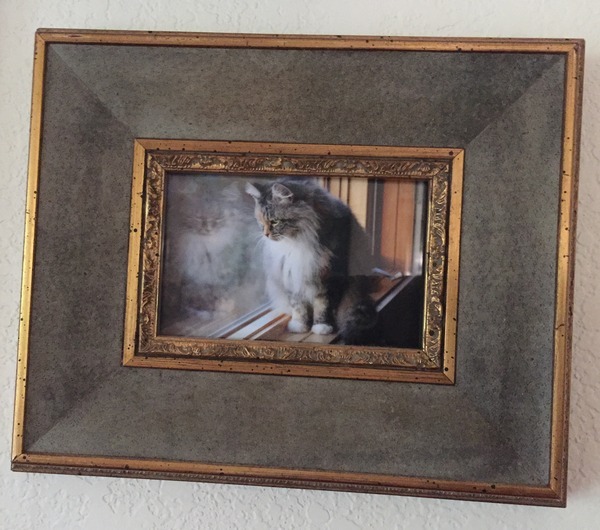 He could not believe I wanted to keep it and mount it onto blocks of wood with old springs and other bits of rust. It stands as tall as me and I think of Garland and how he knew just how to clear the land to give us the best view even when it was just him on his machine in the middle of the woods. 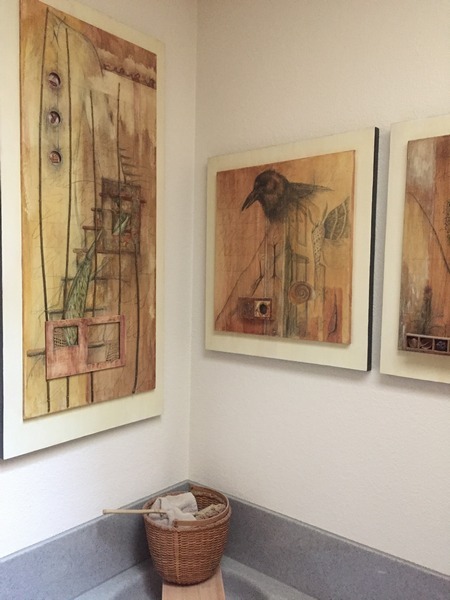 Those baskets were made in classes taught by Grace Kabel in the late 70s. I think she single-handedly is responsible for the contemporary interest in making functional baskets. She taught us. We taught others and it went from there. Because we worked with her, we were given “at cost prices” for materials from the only supplier in the country of packaged cane. Back then it was the by product of the rattan furniture business. Here are others made in her classes that sit at the end of the porch. 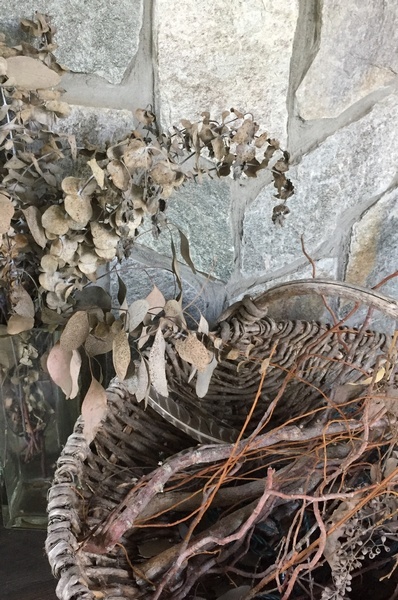 On a bench out there are more of those Eucalyptus stems dried up in a vase behind another old basket that came from a peach farm where my father and I picked peaches not long before he died. And to the left of this bench hangs this. A carved face from the root of a bamboo plant. It is hard for me to pass up things with faces and yet I can’t stand dolls. Odd isn’t it. There is a collection of dolls in the guest room with that pesky cow and his story full of characters and I wonder what to do with them. Obviously I do not like living with them that much because they are in a room I hardly go into. Back to the porch and bamboo. Bamboo and willow sticks with a clay bird hung in. It is the messy end with the only surviving zebra fern. 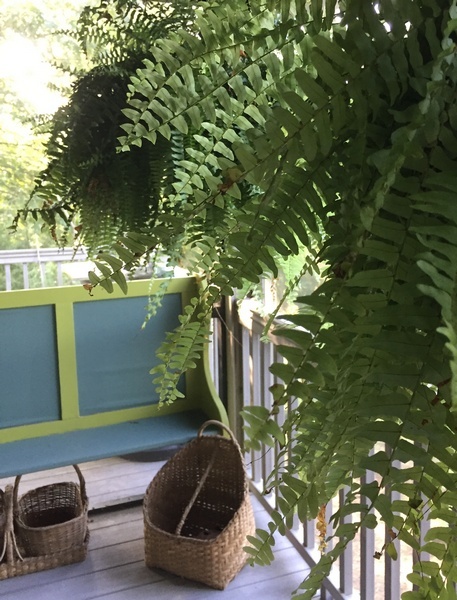 I loved these ferns when they appeared about ten years ago. All yellowish green and mottled. And this too at the messy end. It is the remains of an old pottery fountain that I put dirt into and hoped a plant would want to live there. I didn’t. Old bamboo bits of things that have dried and cracked covering whatever died in there. Some rocks and a blue glazed clay round thing that a friend in Australia gave me years ago because I admired it. I never should have brought it home. 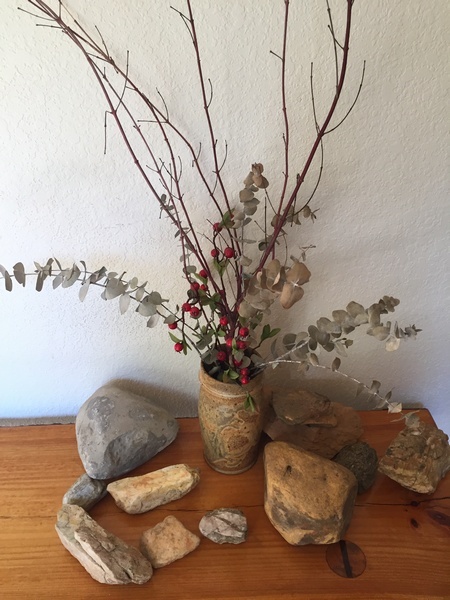 I tried to float it like she did in clear fresh water with just the right stones in just the right pot and look what I did….neglected it to the point of it chipping and being stuck here with other sad things that for some reason I can’t toss out. I should have said, “No, you keep it here where it will last forever.” But I didn’t and now it has become one of things I live with. I will do more of the happy fun things later but I do like this last image. Something sadly poetic about it. When you walk into someone’s house you see what it is they live with. What things matter enough to see every day, all day. Hopefully this person’s house is not a package setting such as “Rooms to Go” or a section of Ikea that looked like it should come home in boxes to be assembled to look like it was in the store. Hopefully the person whose home you enter has things that have stories. And the stories are why it still sits on the shelf, hangs on the wall, crowds the floor. Thinking of how to pare down our belongings I decided to do a blog of details of the things around the house that I take for granted. These are vignettes of a much larger space. These are things that the cleaning lady swipes a duster over twice a month with no idea of why they are there. The reason they are there is because of their story. They tell me the story over and over again each time I look at them. They sit next to other stories and make up new ones just by rubbing elbows with each other. I am spending more time with them and will take at least two blogs to cover the ones I photographed just today. 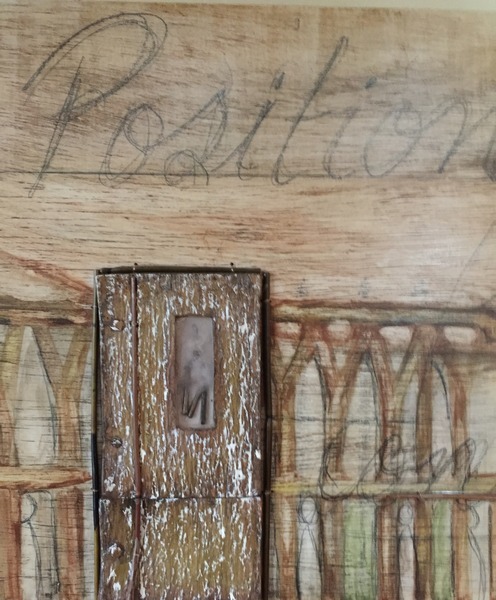 Above is the detail of a long painting/drawing on a wood panel that hangs on the wall between upper and lower cabinets. It is above where the liquor is kept below and the dinner plates above. On it is written some of the text from a poem I wrote about the “Position of Periphery.” Being on the edge of not belonging, not getting involved frees a person from expectations. I love this piece. Here is another end of the panel. Carolina wrens perch along a stick that comes from the mouth of a Xian warrior. I got the idea from a picture I saw in art history classes of the first attempt to put sound into artwork. A small Asian monk had a stick from his mouth with birds perched on it….at least that is how I remember it…..the book is still here not fifteen feet from this but if I look it up to be sure, there is a chance that the story would have to change. I will leave them apart and stick to memory. The wooden bowls were turned by a local wood turner whose wife also turned bowls and had jazz performances in her studio on Saturday nights after her husband passed. One of them has a wine stopper my husband made that I keep handy to plug into red wines only. Just a small pat on the man’s head and the wine is sealed. The large clay vessel is a gift from a friend in the Art Group. Pouring wine from this jug is a performance…..and it takes two hands. 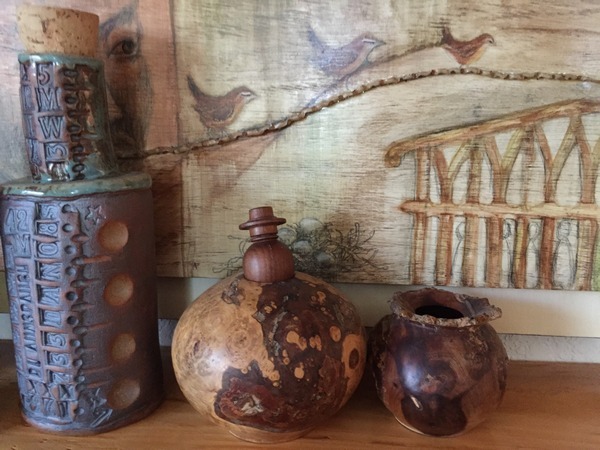 I like how these things look together and when I see the wooden turned bowls move further away from the jug, I bring them back and let my fingers linger on their smooth surfaces and think of quiet old Knude and his wife Lissi. Further down the same set of cabinets is another wooden panel painting with the sugar molds holding bees wax candles and waiting for the next holiday dinner party. 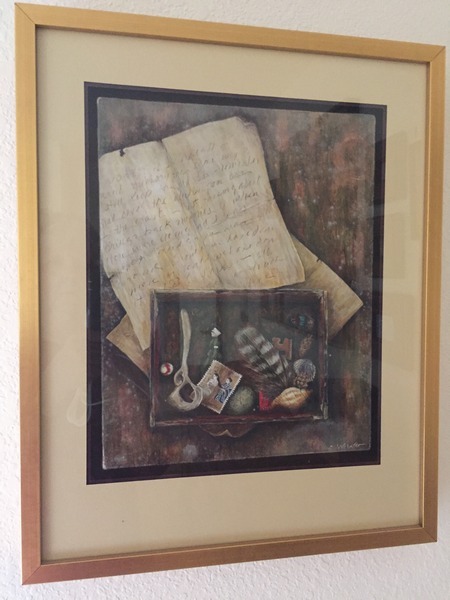 The other end of the same panel has the earth pigments from here as background for a Gaston Bachalard quote about childhood and the discovery of a nest. I think his book, Poetics of Space is my most favorite “art” book. In front are some cups that hold Turkish coffee in just the right proportion with a bit of cream. They were marriage ceremony cups made by a bride and groom who did not stay married. More pottery and a bowl turned by my husband that has dried weeds that a friend and I picked to decorate the Thanksgiving table maybe four years ago. 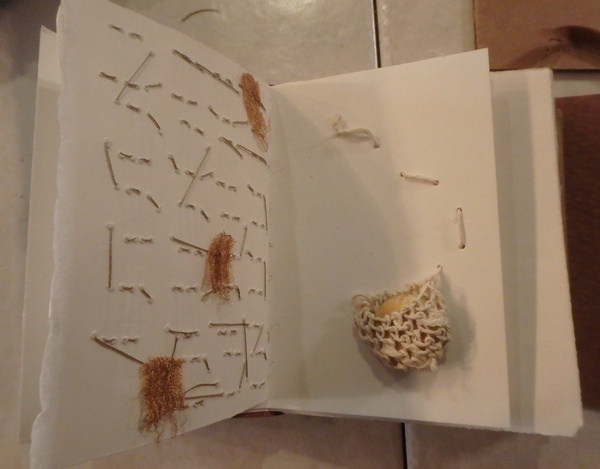 And I still taste her contribution of shredded wheat rolls when I look at these dried up stems too fragile to dust. The long trestle table my husband made sits along the length of those cabinets. It is made of wormy chestnut salvaged from an old building we bought in town years ago. The wooden bowl on the table sits on a Mexican tapa cloth given to me by the same guy who made the jug. 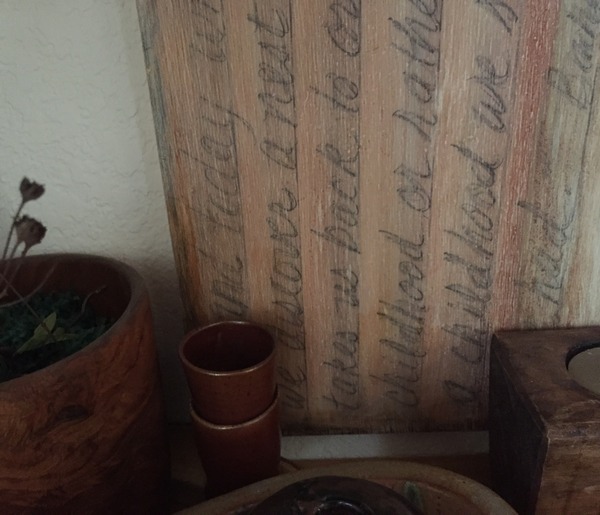 The wooden bowl was carved by my father and husband when they first met fifty years ago. 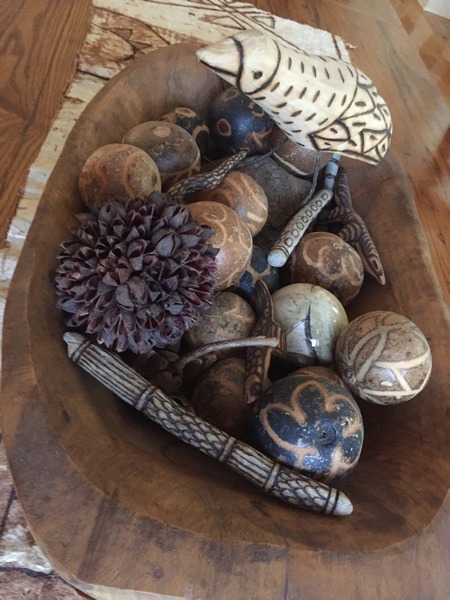 I filled it with these strange balls someone called “monkey balls” and burned driftwood from a friend in Australia and Aboriginal carvings of goannas. The bird with burned markings like the carvings was the perfect addition when I found him in a shop filled with clever things…a shop called Sugar Boo. I think I bought it the same day I saw a woman in there wheeling her therapy pig dressed like Sherlock Holmes around in a baby carriage. Other bits and pieces in the bowl make this such a magic place to dip your hands in and remember. Just off the end of the dining table is a pair of book cases. On top of one sits an upended packing box that held Japanese tea bowls. Now it houses gum nuts and a sharks egg in one cubby, a beaded basket from Bali in another. But the best part is the little antler family I found in a museum shop in Vancouver. I saw just one in the case and fell in love with it. She said, “We have more”. I said, “Show me.” I stopped her after four. They were so hard not to keep together. They are a family. Those little carved faces with drilled eyes and mouth. Their arms and legs swinging on strands of sinew….all that and made by an Eskimo in northern Canada. And next to this box is this. 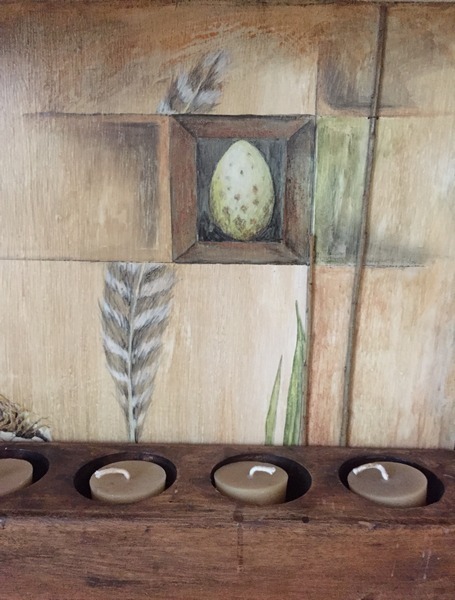 There are three hens or chicks (not sure which) in a soap dish from Africa. 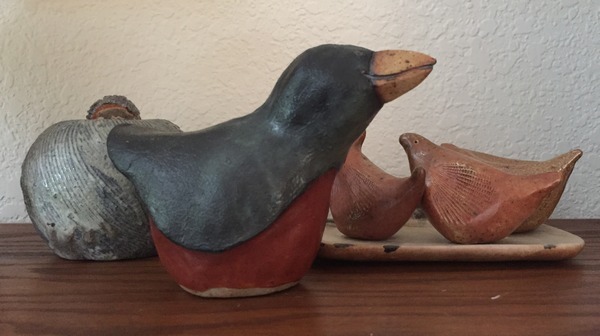 They are watched over by this wonderful stoneware bird….a bird with a smile on its face. I like this kind of pottery. The marks of the hand are all over it. 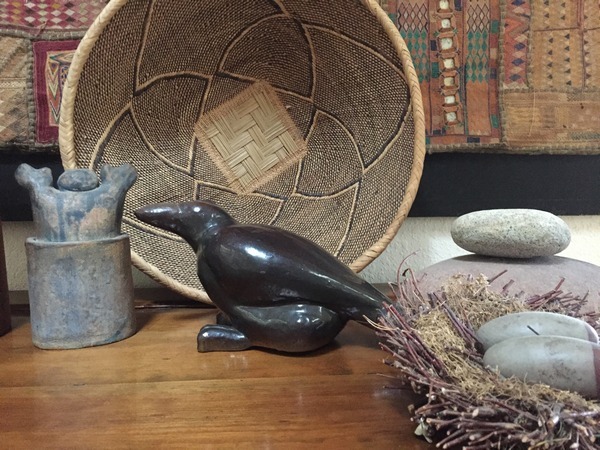 The stoppered piece behind the big bird is made by an Japanese potter living and working in Asheville…..a gift from a friend. The three chicks were made by an older woman in Penland. She took a class I taught there and this was a way of bringing her home. I love how she pressed shells into the clay to look like wings. Over on the other book case sits a collection of Indonesian bottles made from wood and horn. Very intricate designs. The head for the one has been knocked off again and is likely lodged between the book case and the wall. We put them in bamboo cups when they tip over too frequently and now it seems they belong there. 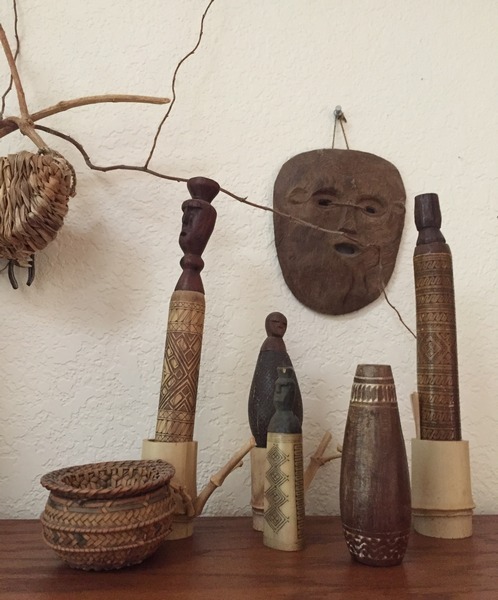 A wooden Balinese mask hangs on the wall and a complex weave snuff basket stays close to these figures. 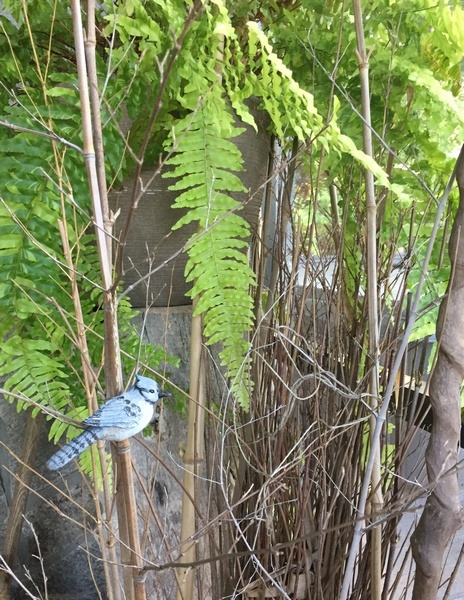 A small basket made by a friend in Australia hangs off a branch. All of these things feel good in the hand and bring back the stories of being in Bali with friends from Australia. They stay away from the Eskimo family….like two different tribes that have only me in common. More dried things are on the wall just past the window by the bookcases. They are from our lotus plants in the water garden outside the front door and are stuffed into a piece of bamboo brought home from Japan. 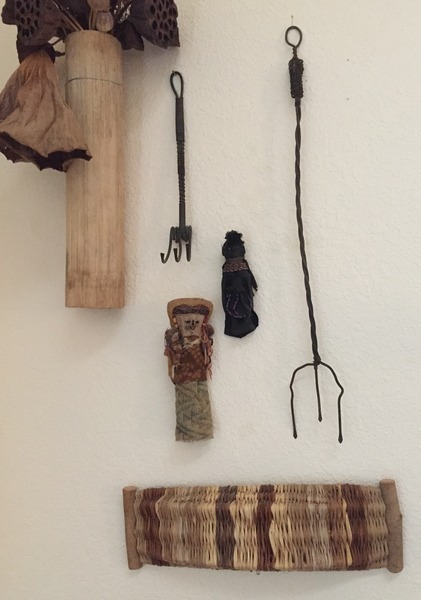 There is an African doll and a Peruvian doll hung between two forks bought in a shop on my first trip to teach in Australia. It was a wonderful big old place in Mittigong. The basket I bought to use for serving crackers, but like most things took on a preciousness because of where it came from. I will do another blog another day…..there are so many more pictures of things that I live with in this large room of kitchen, dining and living space. Now I am getting ready for company and the eclipse tomorrow. And during the past two weeks Sadie and I are still working on the shawl. Here is the opening or “Title Page” of the small leather journal. I had private students here for a few days and I worked on this when not needed to lend a hand. One of them reminded me that those marks of four slashes and then a diagonal one across is referred to as “tally marks.” I had forgotten that and really like the name. It has always been a favorite doodle mark for me….just marking time is how I thought of it…not really counting things by five….just like doing it. 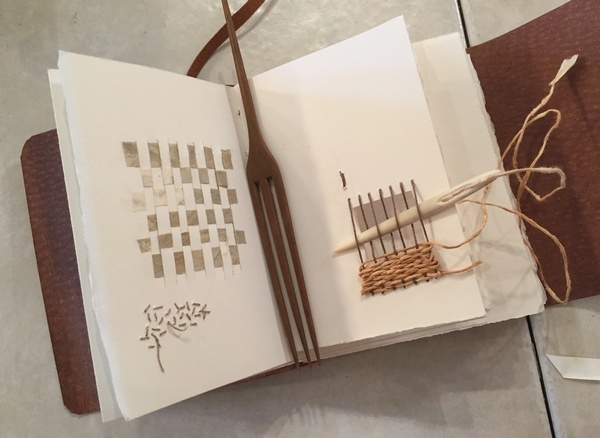 I wove a bit of shifu thread that had been colored with soil from some place special to me and then tied it onto the page. 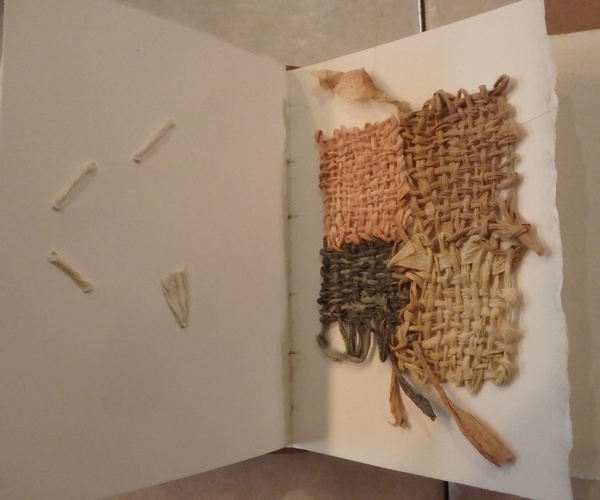 Here is the back of the next page that is a weaving made by making slits into the paper and then plaiting through strips of more Thai kozo paper that were colored with a greenish soil. 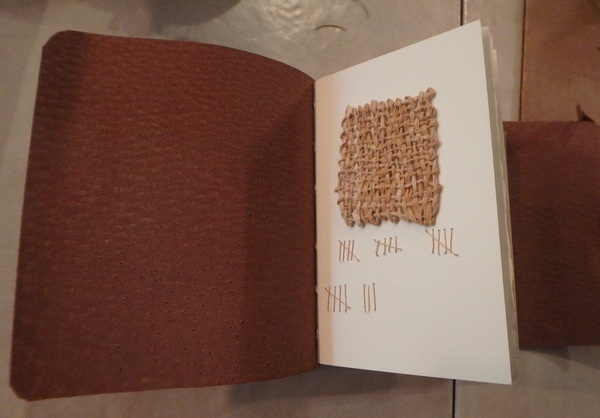 The back of the title page was not so interesting….just the ties and back of the tally mark stitching. At the base of the green paper weaving I did some more stitching with favorite threads and then cut a hole to make another weaving with shifu threads over warps that have been stitched into place. These are two of my favorite tools for doing small weavings with paper. One is the bone needle that a basket maker in Tasmania made (I have several because although I buy them for gifts, I find I can’t part with them) and the other is a small comb that I purchased at Wafu Works in Hobart. It is so perfect for picking up threads and lifting them out of the way and then packing them into place. Here is that page finished. 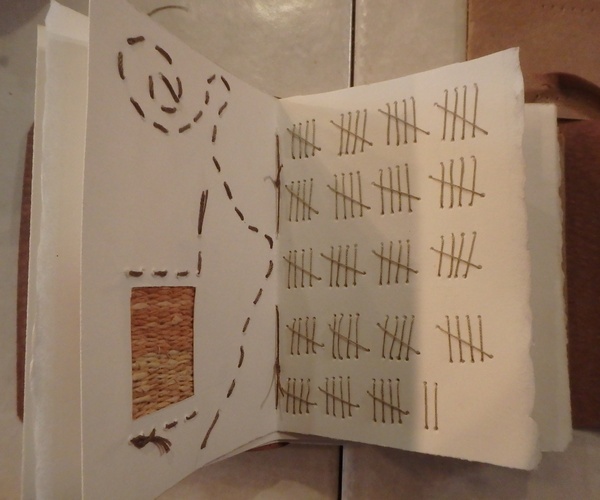 And the back with lots of tally marks on the next page. I like the backs and will likely go back into them with more memory marks. 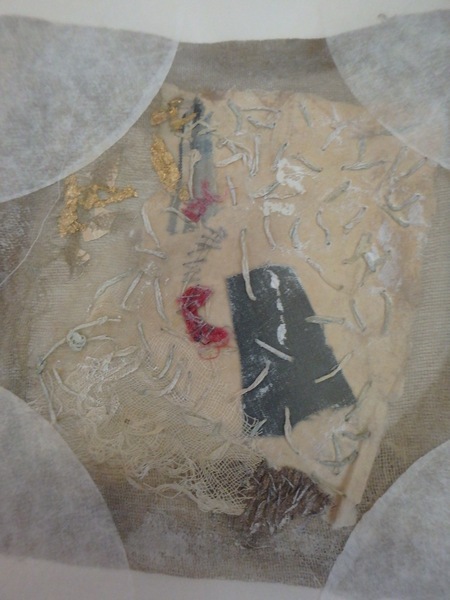 This heavy print making paper is nice to pierce and then stitch through. Like the old learning to stitch cards that we had when were very very young….just put the bright colored yarns into the eye of a very big needle and poke it in and out of the holes. 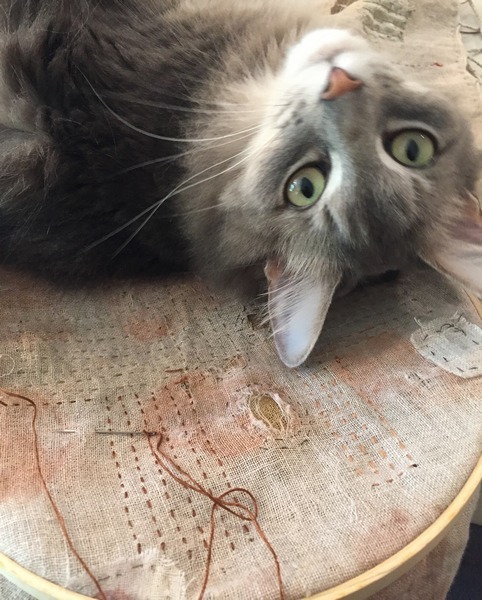 I think we were supposed to be making something by following the direction lines, but I am quite sure that I just filled the entire surface with yarn until I could not get the needle through. And the back of this tally page with some small coppery scraps stuck in place. On the right is a small knotted shifu thread basket holding a small flat round stone. 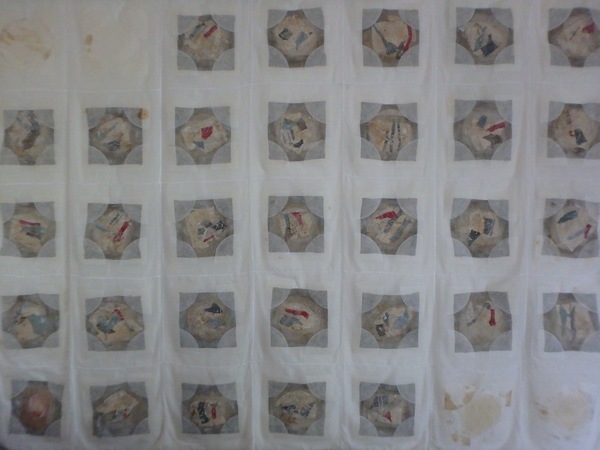 And then the last page of a patchwork cloth of shifu weavings sewn together. I have made a start on this journal. This signature now has something on each page. It is a signature that used slightly smaller folios than the other five signatures. It seemed that they should all be treated similarly. I will continue to back into them before starting on the next set of pages. 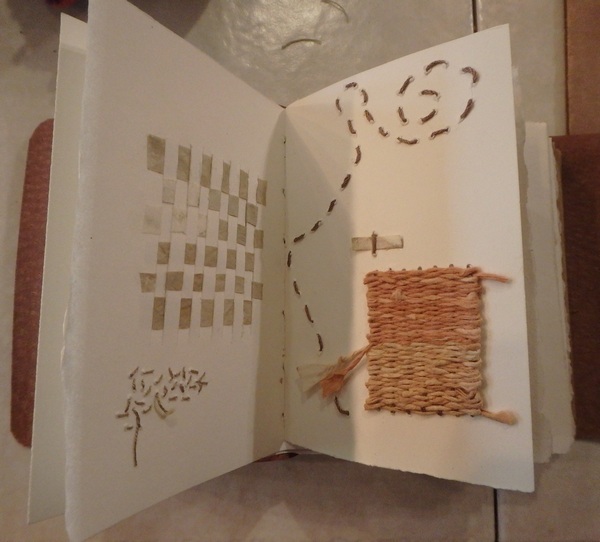 It could be that I am avoiding writing on the pages and will just make marks using cloth and stitch. I might put scraps of our clothing in it. 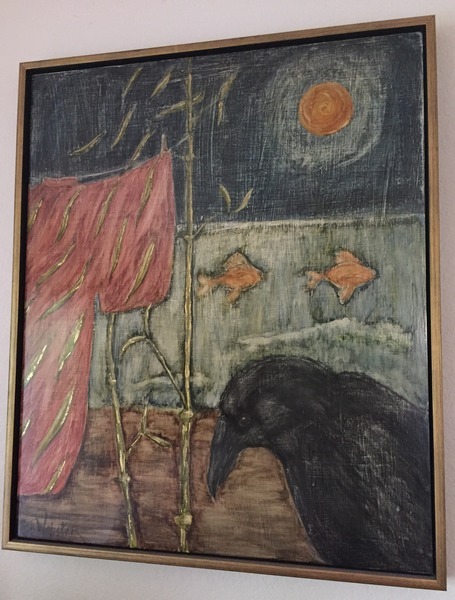 I did that with this very large wall hanging when we were married for thirty some years….about the year 2000. It is made up of coffee filters with comments written on them, spun into threads and holding scraps of our clothing together. Coffee filters were also used in the block-like quilt designs to make up the calendar month of October. On the square where the 27th would have been that year is a copy of a picture of us before we were married that my husband kept in his wallet all those years. This year will be our fiftieth wedding anniversary. 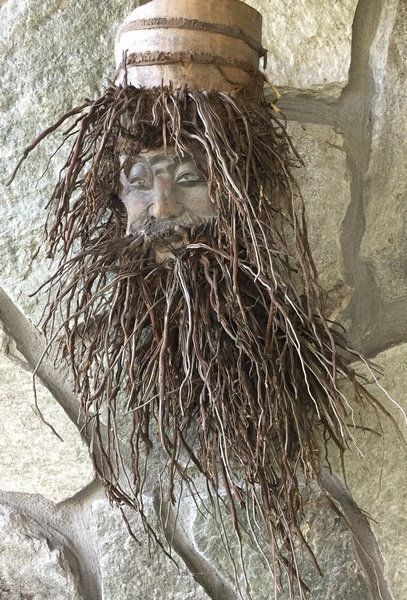 Anyway this piece hangs in the guest room and I think needs to be put away soon….maybe harvested for parts. It covers one wall almost completely as each square is over twelve inches in each direction. Here are some details. 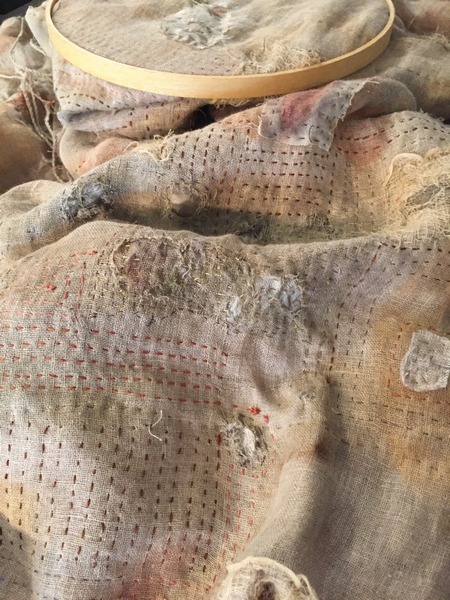 It all had to do with how marriage works….some days things are held together nicely and some days a bit messy. 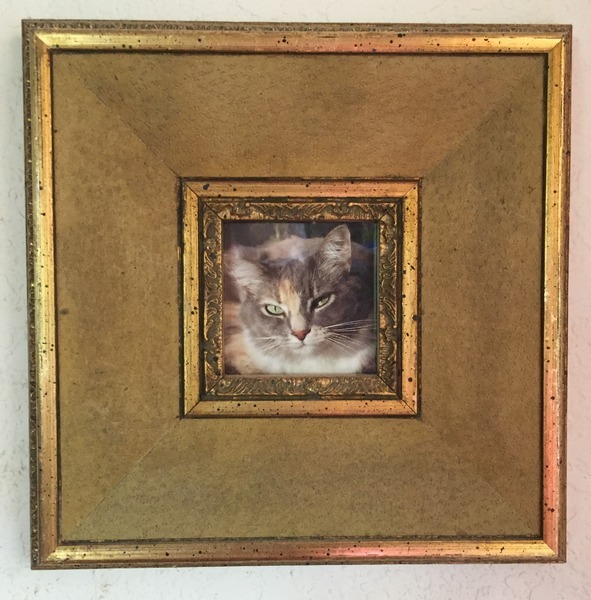 I liked doing this piece but maybe it is time to take if down from the wall of the guest room. I never gave it a thought that some people staying in that room might be wondering what in the world it was. I do like these details though and may just cut some up to put into my Lethe Journal. Put some coffee stains in there too because we still start our day with that….sipping coffee.